Manama-August 19 (BNA) Royal Endurance Team captain Shaikh Nasser bin Hamad Al-Khalifa congratulated Salman Isa who won the World Endurance Championship for eight-year old horses. He finished first in the 160-km-race which was held in Compian, France. 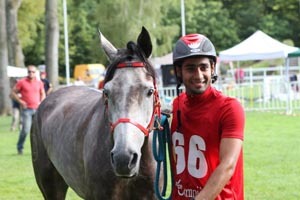 This is the first time Salman Isa takes part in European endurance championships. He won the six-stage race, after fierce competition with EU and GCC riders. French Sandrine Lance and Spanish Monica Komas finished second and third respectively. Salman Isa extended sincere thanks and appreciation to Royal Endurance team captain Shaikh Nasser bin Hamad Al-Khalifa for keenly following up his participation in the World Endurance race for eight-year old horses in France. Fling Tornade with Laia Muixi. Calzadilla with Anna Mª Yebra . Faref Bugati with Ivan Autet. Zarha de Vilaformiu with Oriol Casals. Arizona de Lafon with Francesc Xavier Casellas. Pal Partenon with Otto Velez. Throughout the week, after analyzing the results of veterinary examinations carried out, will communicate the final composition of the list. COMPETITORS travelled from far and wide to take part in the heavy horse endurance event held at Euston Hall on Sunday, which also doubled as an opportunity to check the animals were in good health. Before setting off on the 12-mile course, which the winner completed in 2hrs 46 minutes, the Suffolk Punches were placed on heart monitors by vets who also took blood samples. Nigel Oakley, who has some 16 Suffolk Punches at Rede Hall Farm, said Sunday’s endurance event showed the animals were only needing to work at 50 per cent of their capability. The Selection Panel congratulates these young riders and their horses in achieving the qualifications necessary to represent Australia at the forthcoming World Championships. This is an exciting and very experienced group of young riders and magnificent horses, who certainly have the ability to bring home medals. 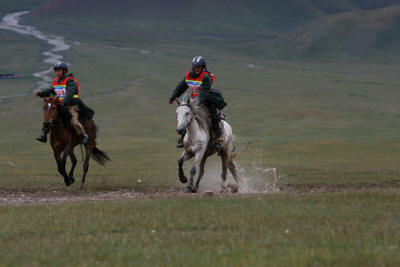 The short list of 4 riders and 5 horses will be announced on September 30 (at the SA Quilty ). The Team will leave for Abu Dhabi mid November.